Whittell senior Trent Dingman drives into the lane against Sierra Lutheran. ZEPHYR COVE, Nev. — It was chippy, physical and there was a lot of chatter. But in the final moments Friday night, it was Whittell seniors Trent Dingman and Isaiah Womack smiling while shooting free throws to close out Sierra Lutheran and grab control of the 1A West League. 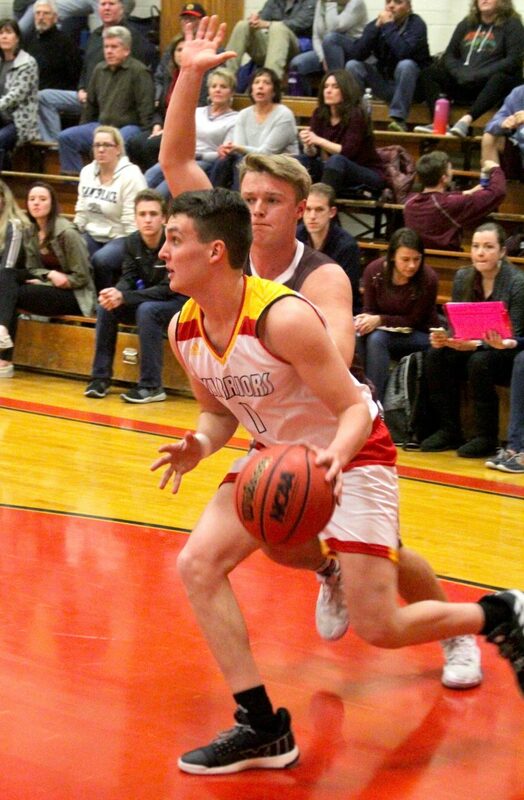 The Warriors used a 21-6 run in the third quarter to break open a close game and beat the Falcons 58-43 in Zephyr Cove, Nev.
Whittell is tied for first place with Sierra Lutheran, who beat the Warriors 55-46 on Jan. 15. But the second round victory trumps the first result and the Warriors will own the No. 1 seed in the Nevada Interscholastic Activities Association Northern Regional playoffs if they win their final four league games. The atmosphere was electric inside the gymnasium. Sierra Lutheran had a strong contingent make the trip from Carson City and they cheered every bit as loud as the home crowd. Whittell and its fans owned the first quarter as the Warriors jumped out to a 10-4 lead with five different players scoring baskets. Sierra Lutheran made its fans happy in the second eight minutes. Led by big man Logan Schinzing’s nine points, the Falcons outscored the Warriors 19-14 and went into halftime trailing just 24-23. The Falcons grabbed a brief first-half lead, 23-21, but Sterling Manchester grabbed an offensive rebound, made the putback and got fouled in the process. He drained his freebie to put Whittell back in front. Whittell and Dingman owned the rest of the game. Dingman found the stroke from long distance and hit four 3-pointers and scored 14 of his game-high 21 points in the third quarter. He hit back-to-back 3s to put the Warriors up 42-27 with two minutes left in the third period. Whittell entered the final period up 45-29. Sierra Lutheran didn’t get much closer the rest of the way. The Falcons began fouling late, but Womack and Dingman drained their free throws, all why smiling as players traded barbs back and forth. “There were mentions of previous games, football games, previous playoffs, they did anything to try and take us down,” Womack said. “We do it too though. It’s not one-sided. Dingman seemed to especially take pleasure in draining late free throws to sink the Falcons’ hopes. Dingman added six rebounds and three assists for the Warriors (16-1, 5-1 West) while Womack scored 15 points, hauled in a team-high seven boards and made three steals, Manchester netted seven points and grabbed six rebounds, Malachi Womack had six points and six board, Jack Johnson scored four and Dylan Wade hit a dagger fourth-quarter 3-pointer and also brought down seven boards. The Warriors have four league games remaining and they beat those four foes by an average of 29 points in the first round of league play. They play Tuesday, weather permitting, at Pyramid Lake (2-10, 0-5 West) and return home at 7:30 p.m. Friday to host Excel Christian (2-11, 1-3 West).